One of my favorite healthy snacks is a handful of berries. Yet these juicy little gems are notorious for spoiling quickly after having been purchased and brought home from the store. Here's a little trick I learned recently that will prolong the freshness and edibility of not only berries but all your produce. The ratio is one part vinegar to ten parts water. Simply mix up the vinegar and water in a bowl and give your fruit a bath. I like to make enough to barely cover the fruit. Let it sit for about a minute before removing the fruit. At that point you can give it another rinse with water, but often I don't bother. Then let the fruit dry on a clean cloth or paper towel. You can do this in a bowl, but I like to use my salad spinner, so I can easily lift out and rinse the berries after they have had their bath. Please do be careful with very tender fruits such as raspberries. Handle them very gently. You will be rewarded with a much longer shelf (or refrigerator) life for your produce... if they don't all get eaten immediately! Have you ever seen a persimmon tree in the dead of winter? After all the thick green leaves have fallen in great heaps on the ground, much of the deeply colored orange fruit remains clustered on the branches, starkly revealed against a grey sky. It is a startling, incongruous sight to see the fruit laid bare on the branches, without the leaves to protect them from view, and the persimmons look like ornaments hung on a wild Christmas tree. You can see where the birds and squirrels have feasted on as many as they could eat, often leaving half before they moved on to another sweet globe, their discards littering the ground, rotting underfoot. The birds twitter at me from up in the branches. The squirrels leave pulverized persimmons on the fence. I'm glad they get to enjoy them too. But this is a story about another kind of Twitter-- the human kind, not the birds in my persimmon tree. Not so long ago on Twitter, my food blogger friend Kalyn of Kalyn's Kitchen made mention of the fact that she had never tasted a persimmon. And there I was with a very prolific persimmon tree going gangbusters in the front yard! Indeed, so prolific, it has become a yearly challenge to find ways to keep them from going to waste. Dear readers, I can only eat so many persimmons. I took bags and bags to donate to Soil Born Farms, where they were in turn distributed to people who needed a little help with the food budget. I took bags of persimmons to work. I took bags to the neighbors down the street. I took a bag to my friend Elise of Simply Recipes, and we reconnected a bit from our too-busy lives. (And as usual I left with some fruit and preserves from her kitchen). 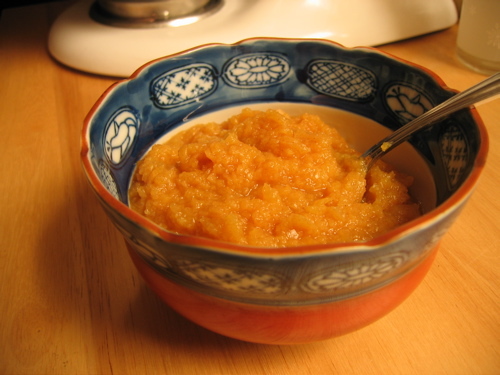 Every year in the late autumn, I search out new recipes that call for the use of persimmons. But this year, I made a deal with Kalyn, who had never eaten a persimmon, on Twitter: I'll send you some persimmons if you will send me a new recipe. I packed up a box of fruit and mailed it, and waited to see the recipe Kalyn would share on her blog. And boy howdy-- did she deliver! Not just one recipe-- but four! For those of you who aren't familiar with Kalyn's blog, Kalyn's Kitchen-- I urge you to make a visit and check it out. Kalyn specializes in creating recipes that are in keeping with the South Beach Diet, a low carbohydrate and very healthy way of cooking and eating that resulted in a very positive change in Kalyn's life (and thousands of others). She tells her story on her blog, (see her Ten Reasons Why I Love the South Beach Diet) and shares hundreds of recipes for each phase of the diet. Luckily for me, persimmons are a very delicious and South-Beach friendly ingredient, and Kalyn researched and perfected several recipes for me and her readers. Find this recipe on Kalyn's blog here. Once there, you will want to check out these recipes: Black Bean Salad with Persimmon and Avocado, Winter Fruit Salad with Persimmons, Pears, and Grapes, and Garlic and Rosemary Roasted Shrimp Skewers with Persimmons. By now it will be evident to you just how creative and generous Kalyn is. Thank you, Kalyn, for sharing such tantalizing recipes! I think I got the better end of the bargain by far, and I will never forget it. 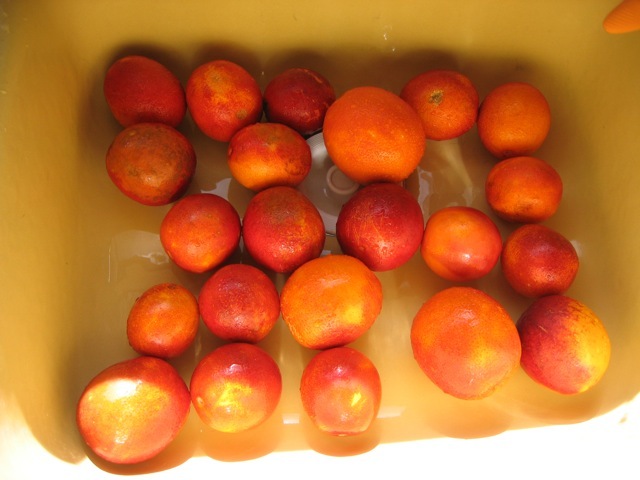 Blood oranges got their name from the deep red color of their juice and fruit. They are usually very sweet and delicious. I love them. 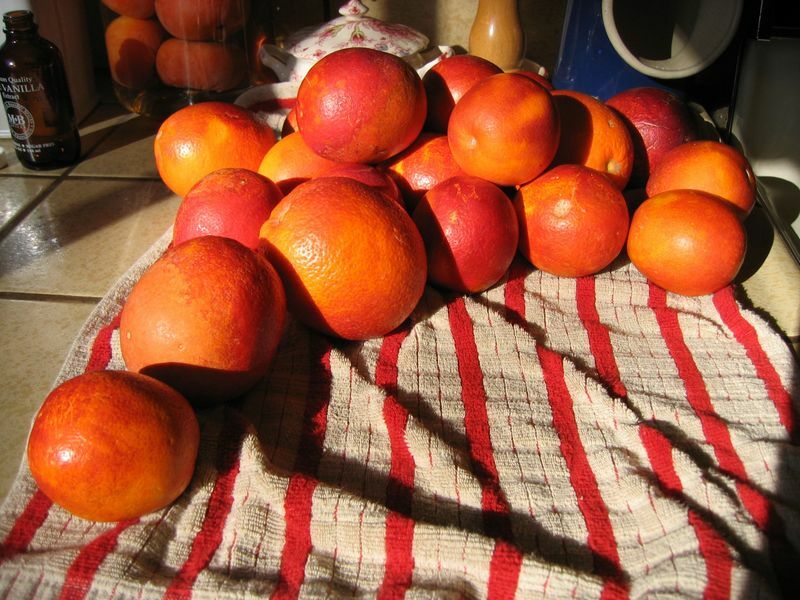 For a great article on the virtues of blood oranges, look no further than Simply Recipes by my friend Elise. Our tree produces lots of fruit, but I am sad to say they are uncharacteristically sour. When we first moved into this house three and a half years ago, the neighbors said "That tree has bad fruit." Of course I thought that was absurd! 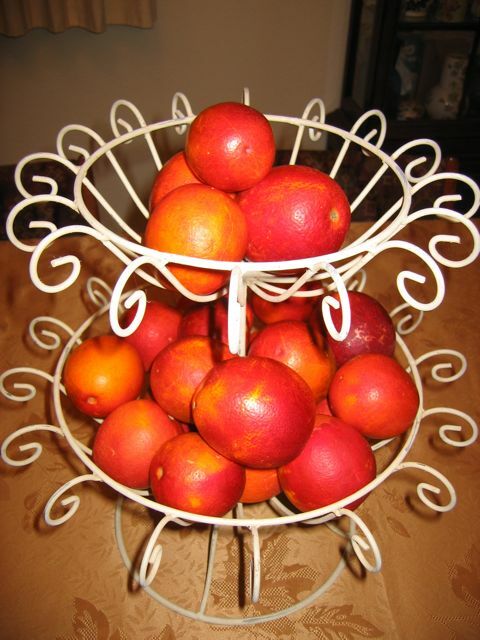 How could a blood orange tree have bad fruit? But although I eat the fruit, I must admit it is barely edible. I blame myself. Surely we must not be feeding or watering the tree correctly? Or perhaps the soil in our garden lacks some essential nutrient. In any case, I refuse to admit defeat. I am feeding it with citrus food, beginning a program of slow and deep (but not too frequent) waterings. I'll let you know how it all turns out. I'll bet you thought I was all out of ideas for using persimmons! Here is a beautiful and tasty way to preserve the harvest: make your own flavored vinegar. Fruit vinegars are often made with citrus such as lemon or oranges, but any fruit can be used to impart their flavor to the vinegar, which can then be used to brighten a salad. The pickled fruit can also be chopped and added to salsas or salads. Prepare the fruit by washing it, and cutting away the calyx and stem. Place the whole fruit into a wide mouth jar, packing them as closely as possible without crushing them. If you need more liquid, blend each additional 1 cup vinegar with 2 to 3 tablespoons sugar. Close the jar airtight. In three weeks to three months, the vinegar will be ready to enjoy. Refrigerate the opened jar. Mix with olive oil and seasonings and use as a dressing for your favorite salad. 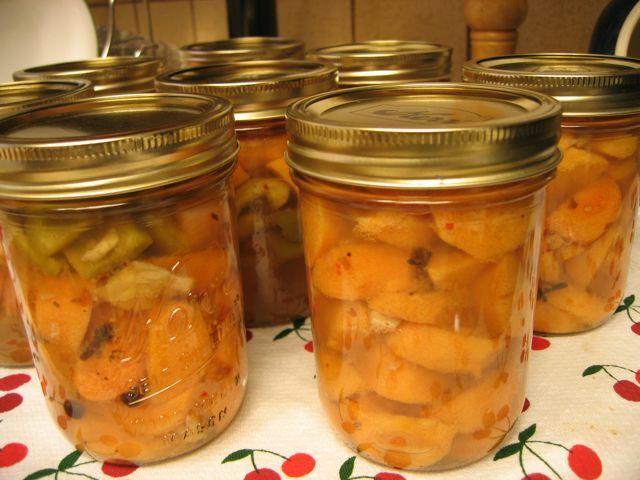 You read that right: persimmon pickles! My epiphany came when I discovered that naturally tart flavors, such as yogurt, pair nicely with persimmons. Could one actually pickle them? I no sooner had formed this question in my mind, planning to devise my own experiment, when I ran across just such a recipe on Sunset.com web site. (Weirdly, I cannot find their link to the original recipe!) 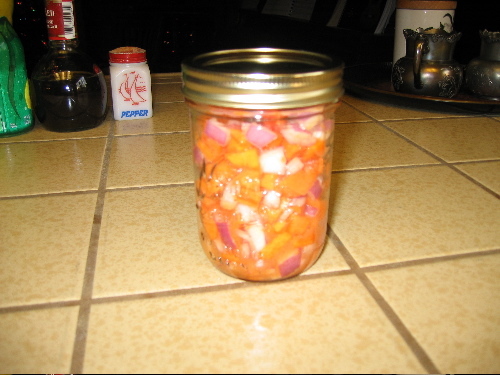 Their recipe is called Fuyu Persimmon Chili Pickles, and calls for the addition of red hot peppers and additional vegetables in the mix such as onions and bell peppers. I could not find the type of red peppers I wanted at the store, so I substituted a sprinkle of red pepper flakes. 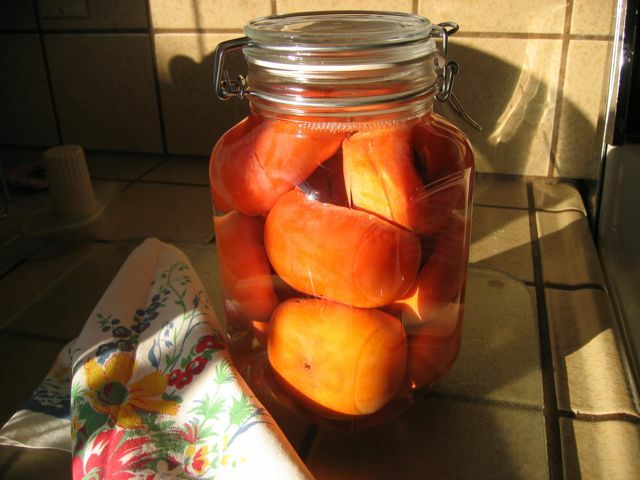 I also ended up pickling more persimmons than the other vegetables, because that was my main concern. Peel, core and cut persimmons into 1-inch wedges, discarding any seeds. Cut the onions and bell peppers into 1-inch squares; set fruit and vegetables aside. Peel and slightly crush the garlic; break each chili in half. In a 4- to 6-quart pan, bring garlic, chili, water, vinegar, salt, and pickling spices to boiling on high heat. 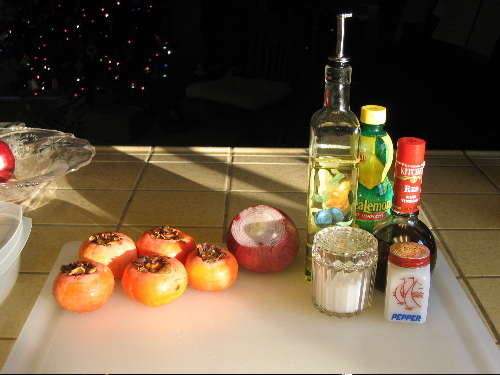 In batches, blanch the persimmons briefly in the hot water and set aside to drain. Pour 1/8 of the onions into each of 8 hot canning jars, 1-pint size. Add 1/8 of the persimmons to each jar, then top with 1/8 of the bell peppers. Bring cooking liquid to boiling and pour equally into each jar, filling to within 1/4 inch of rim. Can fruit, following traditional methods. Store in a cool, dark place at least 2 weeks before serving. If jars do not seal, store up to 6 months in the refrigerator, up to 1 month if opened. Makes 8 pints. This was my first foray into "real" canning, and it was both daunting and fun. 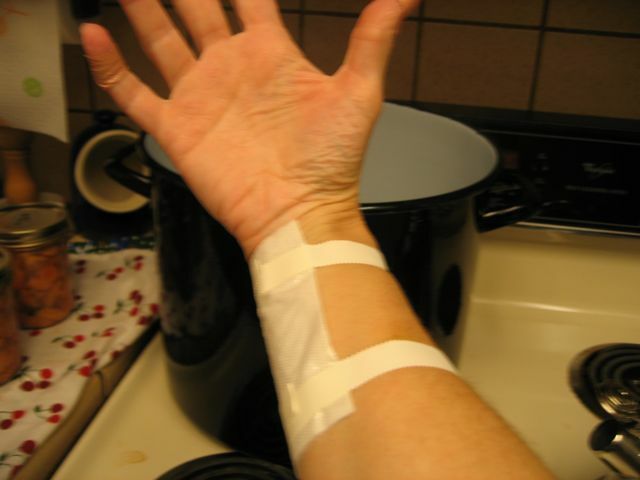 Now, I know that steam is very very hot and can burn, (I always drain pasta holding it well away from my body and face) but I did indeed make the Rookie Error of reaching over the pot of simmering jars, and count myself lucky that the burn I got was actually rather mild and only hurt for a day. And I only nicked myself with the knife twice, peeling those slippery pieces of fruit. Here's another thing I learned: Take the amount of time you think it will take to prepare the fruit, and then double it. And prepare it ALL before you begin the canning process, because you don't want your pickling solution to boil away before the fruit is ready. I know this from personal and unfortunate experience. Having said that, we have been waiting patiently for a couple of weeks while the persimmon pickles make their magic transformation. I am about ready to crack open a jar and see if I am happy with the results. I am a tad concerned that the fruit was too soft, and that the texture will come out mushy. (shudder). I suppose if it does I could puree it into a kind of pickled chutney? I'll report back. But don't the jars look all pretty? It makes me happy to see them in the pantry. I'm forever trying to come up with new ways to enjoy the crisp, sweet Fuyu persimmons from our tree. Usually I bake with them or simply slice and eat them raw. Because they are naturally so sweet, I often want to pair them with something else to cut the sweetness while playing up the spicy notes in this unusual fruit. Then it came to me in a brilliant flash of insight: Yogurt! The tart and creamy tang of plain yogurt is the perfect foil for the sweetness of the persimmon, while the persimmon mellows out the sourness of the yogurt. A sprinkle of crunchy granola or walnuts adds the perfect textural garnish. 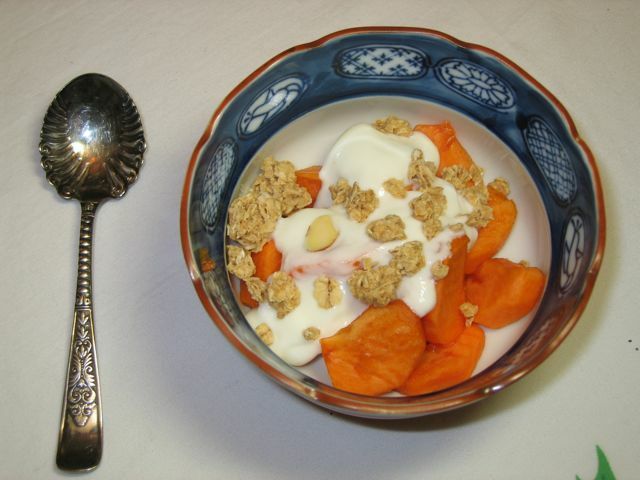 Fruit, yogurt and granola is hardly a new combination, but using persimmons this way was a revelation for me. It works as breakfast or a dessert. I know what you're thinking. "If persimmons play well with yogurt, wouldn't they work nicely with sour cream too?" As I puzzled over new ways to use our abundant crop of persimmons this year, an idea came to me in a flash: These are the crisp variety of persimmons, that one eats like apples. I'll make persimmon sauce! Since I had never made apple sauce before, (let alone even heard of persimmon sauce,) I consulted the brilliant and comprehensive book, Sauces: Classical and Contemporary Sauce Making by James Peterson. This book was an award winner and for good reason. I remembered that there was a section on fruit sauces, and I based my recipe on his guidance. The sauce was delicious, and I felt that I had really discovered something. 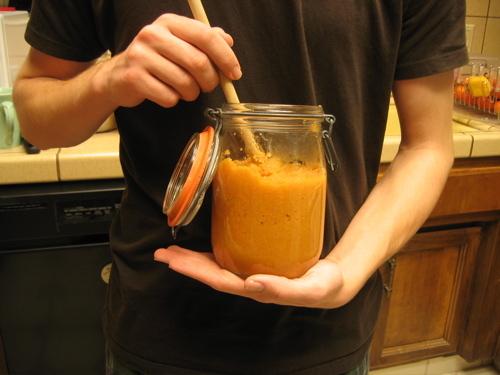 The persimmon sauce tastes light and refreshing, and can be frozen for future use. Serve chilled with an extra sprinkle of cinnamon to taste. Clean, peel and core two cups of chopped Fuyu persimmons (about five good sized persimmons). Cover the chopped persimmons with water in a saucepan and bring to a boil. Reduce to simmer until fruit is soft and easily pierced with a fork. This could take 20 to 30 minutes. Remove the fruit from the heat. Drain the fruit, but reserve the cooking liquid for future use. After the cooked fruit has cooled, place it into a food processor and pulse it until it is desired smooth consistency. Add cooking liquid, a few tablespoons at a time, to make a smooth sauce. I used at least a quarter cup of the liquid. Place the sauce into a mixing bowl. Add a few tablespoons of fresh lemon juice (to taste), and a generous sprinkling of cinnamon and nutmeg (optional). Chill the sauce and enjoy! Here's a rookie cookery tip for you: Cutting up a clever serving bowl out of the watermelon rind is NOT like carving a pumpkin. I found this out the hard way, when I decided that I would finally make one of those artfully carved melon bowls by slicing the little zig zag pattern directly into the watermelon, just as if I were carving the big grin on a jack-o-lantern....and then trying to pry the thing apart without destroying it. This was unwise, but somehow I mangled--I mean I managed it. In retrospect, what I should have done was simply slice the watermelon neatly in half, in a straight line. THEN I could use the melon baller to empty out the rind, THEN I could have carved the artfully shaped rim. 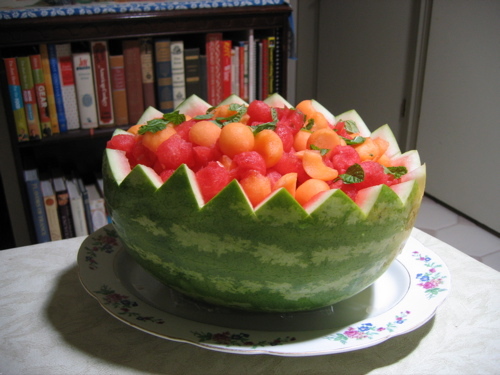 As it turns out, one big watermelon yields a large number of melon balls, so I had plenty to fill the bowl for this fruit salad, plus some left over. 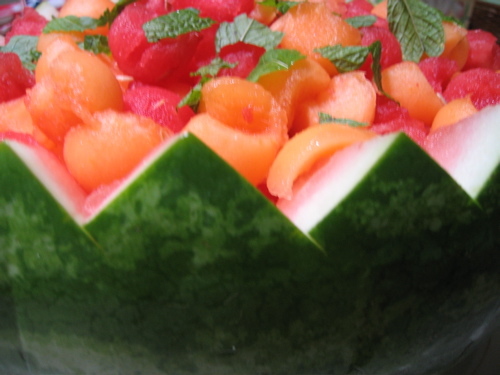 I also carved a couple of cantelopes into the mix, and garnished it with some fresh mint leaves from the garden. This was a big hit at the picnic, as well as finally providing me with a chance to use the melon baller (and give my right forearm a workout!). Everyone needs to do this at least once, don't you think? My son Evan came home from his summer job with a generous gift of lemons from the tree of his employer, Mary Ose. Beautiful! I immediately set about to cook and bake with them (examples to follow iin my next posts). I still have a bunch left, and my sister in law Sue suggested that I squeeze the juice and freeze it in an ice-cube tray. The lemon cubes can then be kept frozen in a freezer bag, already divided into individual portions, to be taken out and used as needed. She also suggested that they can be used to make lemon aid. I love a clever way to use "leftovers" and extend a harvest! 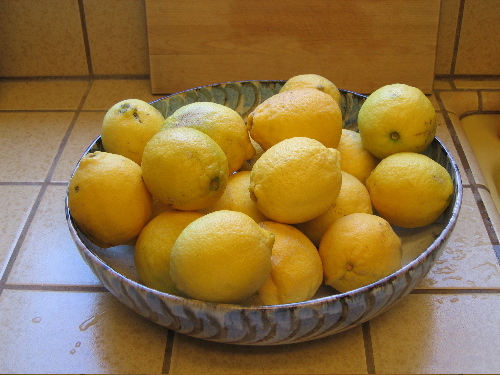 I use lemons frequently now, and Jim and I plan to plant a dwarf lemon tree soon. Our beautiful new home has a gorgeous Fuyu persimmon tree in the front yard. This past fall I went ga-ga over persimmons and tried to find different ways to enjoy them. This is my own recipe for persimmon chutney which I adapted from a basic or generic fruit-based chutney recipe in The Cook's Bible. I peeled the persimmons, sliced and diced them fine. Then I did the same with the red onion. The red onion adds a wonderful punch of color as well as flavor. Then I added a little extra virgin olive oil, kosher salt, fresh ground pepper, lemon juice, (fresh is best if it is on hand), red wine vinegar and a generous dash of cayenne pepper. (We like spicy foods in our house!) Toss gently and let marinate a day or so in the fridge for best results. The chutney was delicious served over fish, chicken, or any other savory dish. The sweet persimmons play off the onions and savory, tart and peppery seasonings, and was a delightful surprise for otherwise mild foods. Persimmons are not generally canned fruits but I intend to try it just to see what happens, if there are any left by the time I get around to it! The Fuyu persimmons are spectacular eaten out of hand, and I also love them chopped up and drizzled with plain yogurt and a sprinkle of chopped walnuts, or with a dollop of sour cream lightly sweetened with brown sugar.